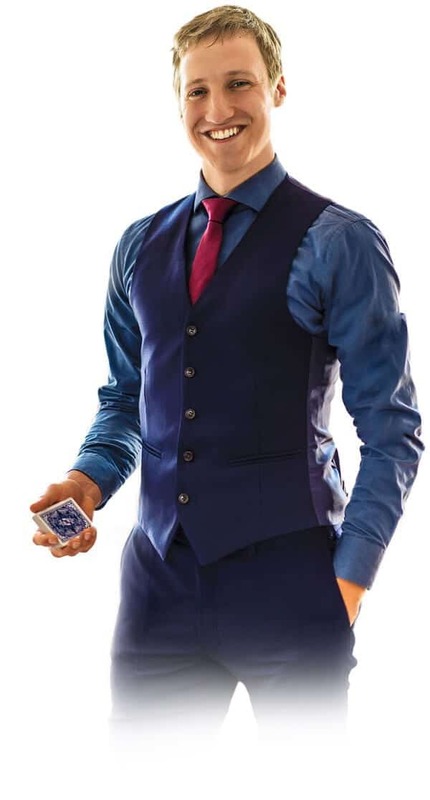 Why book an event magician? When planning an event, you might want to reach different goals. Often it is all about connecting. Maybe you want to bring people together at your corporate event or increase the bonding of your team at the Christmas staff party. Or do you want to put your new brand or products into focus? In any case I will help you to make your event a success! When people witness impossible things happen, they want to share their stories with other people. Enjoying an amazing experience in a group can deepen their relation. As a close up magician I can give you an intimate experience right in front of your eyes. I will always pay attention to the situation at the table and respect intimate conversations. I will never force my magic on someone. I give out mysterious presents to the guests which have already seen my magic. They can wrap their minds around these together and even have a reason to contact other groups, since not all people get the same riddles. Solving a riddle together is a wonderful way to get to know someone in a relaxed athmosphere, isn´t it? If you want to put focus on your brand or products you should contact me early. I can think about possible ways to present them and work something out with you then. Since all products are different I will need some time to come up with the best solution. You want everybody to share the same experience? If you want all your guests to experience the same magic together, my stage program might be the right choice for you. As a professional magician I am always reliable. No matter what kind of event, I will be there early to make sure I can adapt to last minute changes. It does not matter if you book me for a corporate event in Berlin, a Christmas staff party in Potsdam or a gala event in Hamburg. I will always do everything I can to make your event a success! Do you want to book me as a event magician or do you have further questions? Feel free to contact me and I will be glad to answer all of them.